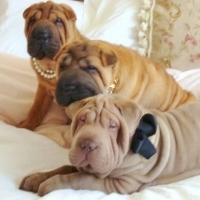 At Baggins Shar-Pei kennel, we have been producing champion show dogs for over 30 years. We are one of a very few elite Shar-Pei show kennels, with more than 100 champions to our name. As a show kennel, our goal at Baggins Shar-Pei is to improve the breed by producing the healthiest dogs possible and striving to realize the ideal set out in the Chinese Shar-Pei standard. Baggins Shar-Pei compete in dog shows where they are judged for their conformance to the standard. To become recognized as a champion requires several wins at competitive dog shows. Only the very best examples of the Shar-Pei breed become champions. I carefully select Shar-Pei for breeding based on my knowledge of the genetics and pedigree of each animal. I am always striving to eliminate the last few imperfections and produce that perfect Shar-Pei. Until then, I will often have Shar-Pei puppies available that are not suited for my continuing breeding program, but are nevertheless beautiful and healthy dogs who need a good home.